Last Tuesday, October 12 2010, Gilly, Ale and I attended JISC’s curriculum design and curriculum deliver joint programme meeting at Nottingham. The theme of the meeting was Delivering the benefits: from project to institutional enhancement. DUCKLING exhibition was well received by the audience. People were really interested in DUCKLING’s technology-enhanced solutions. Four projects won the exhibition award. SpringboardTV, an internet TV station, at the College of West Anglia, won first place. The Integrate project at the University of Exeter was second. Congratulations! This is an online, cloud based video-editing software. You can upload video, audio and picture files and edit them using a simple timeline. The files can then either be published online either to JayCut or to Youtube or downloaded as mp4 files. While creating a graphic to be included in an upcoming book I was unsure whether fonts are subject to copyright (I’m still a little hazy on the answer to that) but found this fantastic resource which allows you to download and use fonts that are licensed under a Creative Commons license. 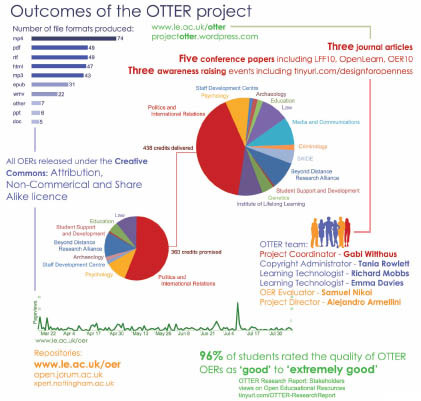 The open space online OTTER Symposium took place in July and featured discussions ‘Could and Should OER replace educators?’ and ‘Copyright: All rights reserved or reversed?’ and are all available to download and view as OERs. Beyond Distance is teaming up with the Australian Digital Futures Institute at the University of Southern Queensland to offer a non-stop, two-day global online conference. Visit www.le.ac.uk/beyonddistance/festival for up-to-date information on keynotes, sessions and workshops and follow BDMediaZoo on Twitter. Do you have a favourite piece of technology? I was inspired by this article in the Guardian: http://www.guardian.co.uk/technology/2010/mar/28/martin-freeman-celebrity-squares to ask two of my fellow learning technologists what their favourite pieces of technology were. One answer was the 13″ MacBook Pro, the other was a label making machine. These two different answers seem to be at different ends of the spectrum of technology although both have their uses. But without a clear purpose for technology new inventions can fall by the wayside. Just a quick Google (one technology that hasn’t failed) and I can pull up a list by Computer World which interestingly includes e-Readers as a failed technology: http://tinyurl.com/yftpb3j. Your favourite piece of technology might be one that satisfies a certain purpose for you whether that’s reading an e-book or even labelling something. You might find that if you explore other technologies and their uses more, like we did with e-Readers, that you will find another piece of technology that becomes one of your favourites. What’s my favourite piece of technology? Running through some of the different technologies that I own and use: Blackberry, Laptop, iPod Nano, DVD Recorder, Dreamweaver, Adobe Photoshop, Twitter, Digital Camera; I think that my favourite piece of technology would have to be my trustworthy Canon a1. Slightly old school (it’s older than I am) but it’s stood the test of time (hopefully I will too!) and I still aspire to create my own darkroom so I can process the film myself. The Open University hosted a ‘CAMEL’ workshop last week for a cluster of participants in JISC-funded projects. (CAMEL is a great community of practice model for e-learning management. See Theo’s blog for a nice succinct description or the CAMEL website for more info on this.) Ming and I attended from Beyond Distance in our capacity as researchers on the Beyond Distance DUCKLING project. Andy Bardill and Bob Fields from Middlesex University set the scene for the day by telling us about a fascinating project they are doing with their Interaction Design students. Imagine a design studio in a well-equipped university, with a lecturer and six to eight students sitting around a large table, and one student showing his or her photos or drawings to the group for critique. The conventional way to do this is to have each student projecting his or her work onto the wall using a data projector, while the rest of the students comment and take notes. Andy and Bob are not conventional teachers, though, and they felt frustrated at the limited interaction, as most of the students sat with their heads bowed taking notes on their laptops. Their solution was to ban laptops from the classroom (an initially unpopular decision), and to project each student’s work from a ceiling-mounted projector onto the table (an accidental, but very exciting discovery, as it happened) instead of the wall… They covered the table with flipchart paper to provide a sort of screen for the projected image. The side-effect (literally!) was that students started writing their notes on the table around the edges of the projected image, instead of typing on their disallowed laptops. This immediately had the effect of making previously private notes public, and catapulted the group into deeper conversation. At the end of each session, students started spontaneously taking photos of the conversation on the table as a record of their ‘notes’. You can see some of these intriguing photos on Andy Bardill’s Flickr page. 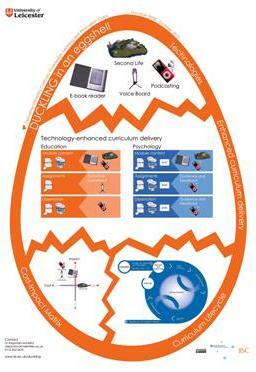 The next development was to video the unfolding conversation on the table with a ceiling-mounted video camera, in order to have a record for later analysis of the learning process. No doubt we’ll hear more from Andy and Bob about what they’ve learnt from this as the project progresses. In the meantime, it is worth noting that the simple act of moving the focus from the wall (‘out there/ away from us’) to the table (‘in here/ amongst us’) resulted in a change of perspective for the whole group. It enabled people to physically move around the image. Their interactions became focused on the centre of the table, as they gestured towards the central image while discussing it. A bit like the hub of a wheel that keeps the spokes together, this central point kept the participants connected in a way that a projected image on a wall cannot easily do. The popular literature from neurolinguistic programming also tells us that when we look down, we are drawing more on the emotional part of our brain. Perhaps there’s something in that too. I recently attended the JISC Conference entitled ‘Transformation: Managing and Measuring Change.’ The Conference focused on best practice in change management, and discussed strategies for implementing change. One presentation that inspired me to think about my work within the DUCKLING project was a talk by Clive Anderson. The talk considered the ‘knowing-doing gap’. This idea was inspired by the thoughts of Pfeffer and Sutton (1999), based around the principle that moving from ignorance to knowledge is not a difficult transition: the real challenge is taking the step from knowledge to implementation, i.e. making sure that change actually happens. Before we take action to implement any kind of change, we need to think carefully about what we are going to do and why we are going to do it. As academics, we often (quite rightly) want to take this knowledge-gathering process as far as we can. We often strive to be experts in our field. We want to know as much as possible about what we do, drawing on existing knowledge and conducting research to gather new information. When implementing changes to our existing courses, we will naturally want to apply this same approach: we want to know details about what we are changing, why we are changing it, how these changes will take place and what they will involve. The question is: at what point do we make that transition and move from ‘knowing’ to ‘doing’? DUCKLING is a 2 year project in which we aim to incorporate new technologies into the delivery of our course materials. Our course team have the advantage of working with experts in the BDRA, so our interventions are informed by the extensive knowledge of the team members. This allows us to have confidence in the theoretical and empirical basis of the strategies we will implement. Despite this, it is still easy to spend a lot of time standing on the edge of the ‘knowing-doing’ divide. However much we know, we could always know a bit more. However much we prepare ourselves for implementing changes, there will always be more preparation we could undertake; other issues we could consider. It is also worth noting that some changes seem easier to implement than others: the course team were fairly quick to produce podcasts and to make them available to our students. We seem equally keen to distribute ebook readers for students to use within their studies. Yet with Second Life technologies, we seem less certain, perhaps because this is such new territory, and will involve taking a step slightly further outside our ‘comfort zone’? 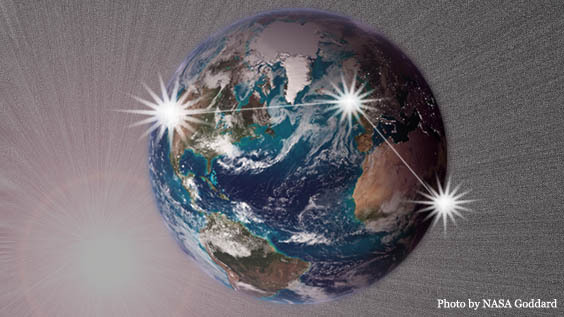 We have many ideas about how Second Life can be used (through various SL-tivities). A couple more weeks of planning ought to be enough time for us to begin implementing some of these ideas. Yet there is some apprehensiveness in terms of actually ‘doing’ this: in breaking that knowing-doing barrier. There are some genuine concerns over what will happen when we find our (avatar) selves in this virtual reality, with student avatars expectantly waiting for us to deliver. Perhaps these fears are preventing us from taking the steps necessary to take forward our ideas and put them into action? I am writing this blog as much to motivate myself as to motivate others. The message I am trying to convey is that, as change agents committed to enhancing the learning experiences of our students, we need to take the leap; give it a try; make it happen. If things go wrong, we can learn from this. But if we’re not prepared to put our knowledge into action, then how can we expect anything to change for the better? Student feedback: an example of diffusion of responsibility among online learners? As a member of staff involved in the teaching of an MSc distance learning course, I am currently facing a dilemma that appears to be fairly common to academic staff: it involves trying to encourage students to complete ‘satisfaction questionnaires’ and module evaluation forms. As part of the DUCKLING project, we need to encourage students to complete online questionnaires to get some insight into what they think about their course, and their perceptions towards the incorporation of new technologies within those courses. The questionnaires themselves are very short, often with simple Likert-style responses, requiring no more than a few minutes of their time to tick a few boxes. So what is the problem? Why is there such a low response rate? There are many possibilities to explain why students may be reluctant to complete feedback forms. Are they too busy? Do they think it is not important? Are they forgetful? Do they have concerns about the anonymity and confidentiality of their responses? Are they lazy? Do they know the forms are even there? Perhaps the provision of incentives could help. Surely offering a £10 or £20 book voucher, or making some other form of reward available within a prize draw would help matters? Having quickly skimmed the literature on this, it seems as though incentives can and do play a part in increasing response rates to a limited degree, but this strategy poses further challenges. What kind of incentive is likely to be successful? What if there is no budget available to provide a prize? Surely the students should feel some sense of obligation to complete these feedback forms which, at the end of the day, are intended to be used to improve the course for their own benefit? In considering this, and in an effort to think up ways of increasing response rates, I thought back to my own days as a student. I would always fill out feedback forms when they were handed out in a lecture and had to be returned upon leaving the lecture theatre. But what about online questionnaires? Our students are asked to complete and return feedback within a virtual learning environment (Blackboard). I often receive various online surveys through my email and facebook accounts, and if I’m honest, I very rarely complete them. So is it something about the virtual world that makes us feel as though there is less pressure to return these forms than if they are presented to us in a face-to-face environment? In understanding this, I started thinking back to a basic theory within social psychology: diffusion of responsibility. The definition of this phenomenon in my first year psychology textbook is: “Social inhibition of helping, caused by a weakened sense of responsibility in a group of bystanders … Each individual member of the group feels less responsibility to intervene in a group than when alone.” (Hewstone, Stroebe & Stephenson, 1996, p.610). I wonder whether, to some degree, a similar phenomenon takes place in the virtual world in terms of returning feedback. On an online course, it is not possible for students to see other students completing questionnaires, or to know whether others have already done so. Upon seeing that it will ‘only take a few minutes to complete,’ students may assume that “everybody else will have done it already, so there is no need for me to complete it as well.” The tendency for an individual to think they do not need to help because others will already be helping is a typical example of diffusion of responsibility: the more ‘others’ perceived to be involved, the less obliged the individual will feel to take action. If this is true, is there a solution? My thoughts are that perhaps we need to be more honest with our students about the poor feedback we receive: to tell them that nobody has completed the form and clearly state the importance and benefits of doing so. But more than this, I think there should be some kind of update/counter available, either next to the survey in Blackboard, or perhaps on the announcements screen. A way of telling students that, despite the importance of the survey, only ‘3 out of 150’ students have completed it, whereas we require at least a 60% response rate. Perhaps this kind of approach will help students see that they can’t rely on everybody else to complete these feedback forms: the responsibility is their own.